What’s a “vlog” you say? It’s a portmanteau of “video blog” and if you’ve ever been to YouTube, you’ve definitely seen one. It’s a bit of a household term these days and they do cover some pretty informative, insightful stuff! From tutorials, to reviews, it’s become quite normal to check the vlogs of our favourite internet personalities before we start, do, or buy something. 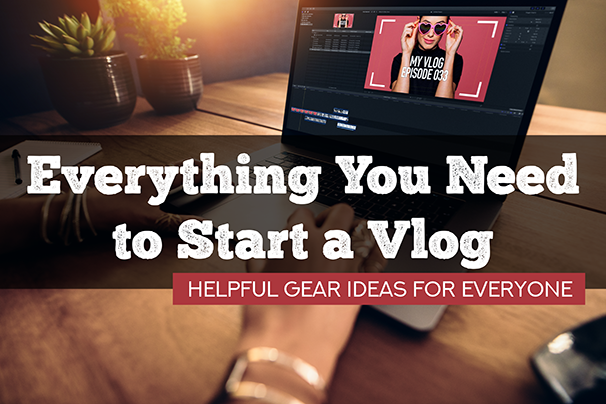 If you’ve been thinking about starting a vlog yourself, but aren’t sure what you need to begin, we’ve done some legwork and created a few kits that’ll make it easier to get the cogs turning. If you’re new to the idea of using a camera entirely, you might prefer to get started with your smartphone. That’ll give you a taste of what to expect as well as a good foundation upon which your cool new hobby can grow. Our own vlogger kit includes a mini tripod and lavalier microphone. It’s pretty much all the basics to get you going right out of the box, just add your own Smartphone. And when you do get over using your phone, no worries, this kit works just fine with cameras as well. The kit's small size makes it very portable. If you’re planning a more ‘out and about’ style vlog, this will fit easily into your bag and, as an added bonus, doesn’t look super-obvious when set-up on a table at your favourite café. Despite being a capable beginner kit already, as you progress, you’ll find little things that could make your life easier. Something like a small LED light might be a good early addition if you find yourself struggling with lighting in different locations. Suggestions: The LitraTorch or the Aputure Amaran AL-M9. 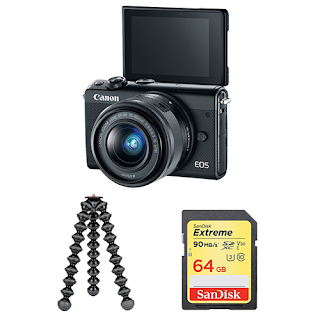 The Canon EOS M6 kit is an excellent step into the realm of vlogging cameras. It comes with a versatile 15-45mm zoom lens that should help you capture dynamic angles and close-ups. It shoots Full HD video, has super-accurate autofocus, and a flip-up touch screen so you can see yourself while you record. This is a real benefit, as you can easily make sure you’re still in frame and not drifting off to the side somewhere. The included 64gb memory card has enough capacity to record your newest episode, while the Joby Gorillapod gives you the flexibility to position your camera very creatively. A dedicated microphone would knock this kit into a whole new tier of awesome. If you’re going to be alone in a small space, you can get away with a little on-camera mic. If you’ll be working in larger areas or chatting with other people, a set of lavalier mics will significantly improve your sound quality and vocal clarity. Suggestions: For an on-camera mic, the Rode VideoMic GO. For a lavalier mic, the Rode SmartLav+. Getting more advanced, the Sony a6400 vlogging kit is kind of like a perfect storm. It’s pocket-sized performance that’s accessorised and raring to go. Sony's a6400 is a very capable camera with a boat-load of features that'll make vlogging life super-easy, like the real-time eye tracking autofocus. This keeps your eyes in focus, even if you’re moving around the frame. You can see all this on the handy flip-up screen, to. It also shoots 4K which really lets you step up your video game in terms of smoothness and clarity. Bonus, viewers tend to appreciate it too. 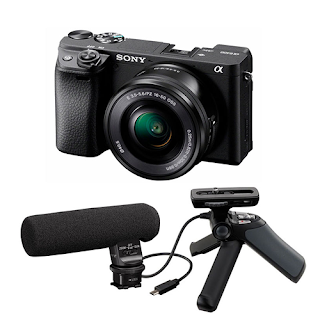 The kit includes an on-camera shotgun microphone and a mini tripod that’s perfect for interviews or shooting a selfie-style video. 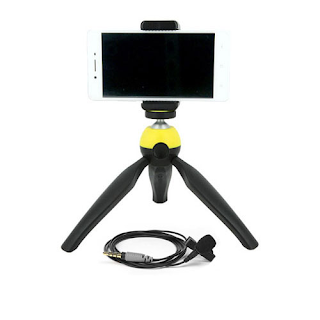 When closed, the mini tripod acts as a comfy little hand grip that features convenient controls like start/stop recording, still image capture, and zoom. This makes it really easy to start new clips or change your framing without having to touch the actual camera. While this is more than enough to get started, there’s still other goodies that might end up on your shopping list. For starters, a gimbal would go a long way. Not only does the longer handle make it easier to hold the camera, gimbals offer incredible stabilisation and oftentimes they have accessory attachment points to help keep the weight off your camera. Another addition that would make a big difference is an LED light or two. Especially if you’re a more active ‘on-location’ vlogger, you can never be certain what the lighting situation will be at your destination. Best to be ready for anything! Suggestions: For gimbals, see the Feiyu AK4000 and the Zhiyun WEEBILL Lab. For LED lighting options, check out the Rotolight RL48 Ring Light, or the Aputure Amaran AL-H198. The Z6 comes with a 24-70mm lens, a favourite for its versatility and perfect for stills and video. The kit also includes the ultra-flexible Zhiyun Weebil Lab gimbal for reliable stability that’s easy to balance and hold, no matter how the camera is mounted. Another feature item is the Atomos Ninja V 5.2-inch external touchscreen monitor which provides a bright, super-sharp display that’s perfect for checking framing and footage. It can be mounted to the gimbal directly using the handy articulating arm, letting you position it as needed for a clear view. Every accessory in this kit has been carefully chosen to make sure it’s a literal all-in-one solution for professionals, businesses, or enthusiasts ready for a serious upgrade in production capabilities. The kits listed above are a bit of aspirational food for thought. 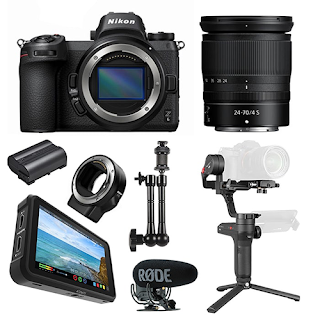 There’s no sort of ‘hard and fast’ requirements for vlogging gear, just because there’s so many factors to consider. Location, style, subject matter, frequency, the list goes on. In reality, the best way to figure out what kind of gear you need is by just getting started with what you have. As you progress and get used to recording regularly, you’ll start to notice which bits and pieces you could add or upgrade to make your workflow smoother, whether that’s a new camera, a better tripod, or lighting. When it comes down to it, the most important thing to do before hitting record is to decide what you’re going to talk about. And that’s a whole other topic in its own right. 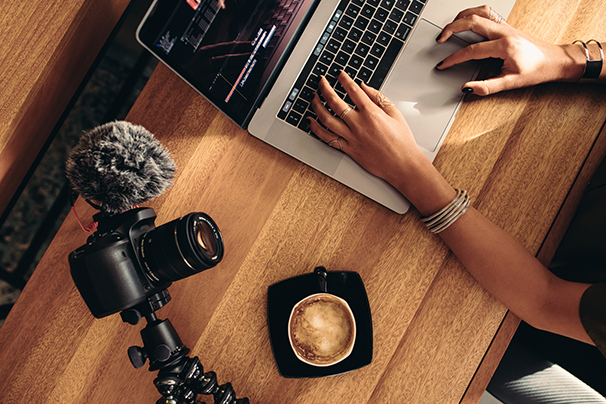 If you’re thinking of getting started and need a little more inspiration, check out our dedicated Vlogging Kit Category! It’s a good starting point, at least for gear, whether you’re looking for a whole kit or just accessory ideas to complement your current set-up. Don’t be afraid to reach out to us for more help, either! Find us online on Facebook and Instagram, or give us call!